Mathematics and language don’t seem to be disciplines as separate as we might imagine them to be. Math has its own peculiar language (or notation if you prefer) which includes symbols unique to mathematics, such as the ‘=’ symbol. Math has its own grammar, shared by mathematicians worldwide regardless of their mother tongue. This includes conventions for writing formula such as e=mc2. Mathematical performance seems to be connected in some way to cognitive ability in general. SAT test scores indicate that high performing students tend to excel at both math and language together; only rarely does a pupil do well in one and very badly in another. Yet it seems that the regions of the brain responsible for language and math processing are quite separate and distinct. It’s also weird that abilities in math and language don’t seem to correlate very well with IQ – you can be great at math yet possess only an average IQ level. It seems that our mother tongue may give us certain advantages when it comes to grappling with mathematics. Our first language seems to impact on how we approach mathematical concepts, possibly by influencing how the problem-solving parts of the brain develop. It’s hard to really pin down research in this area because people from different language backgrounds are also impacted by different cultural learning methods. 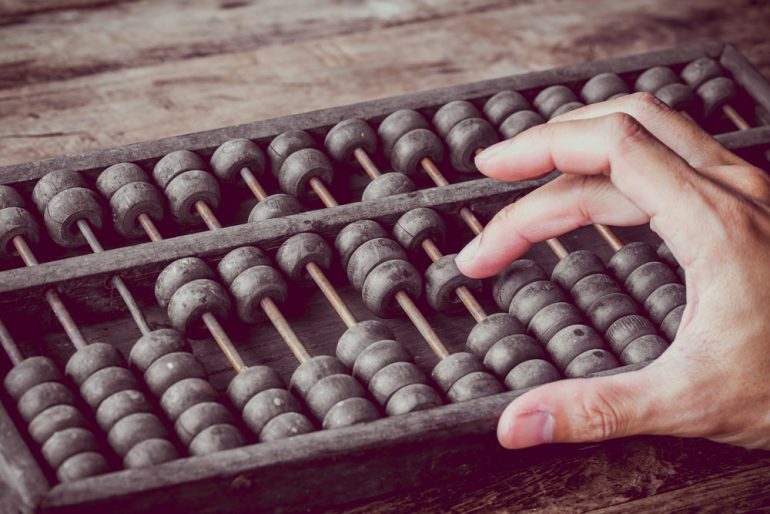 For example, Chinese students are often taught using an abacus, which could help them approach numerical issues in both spatial and visual terms. Commonly known as a suanpan in China, techniques have been developed to calculate multiplication, division, addition, subtraction, square root and cube root operations at high speed. A small study reported in the Journal of Experimental Psychology in 2001 seemed to show that students from a Chinese speaking background were better at solving complex math equations than English speakers from Canada. In a neuroscientific study using MRI brain scanning to observe a small group of people solving math problems, results indicated that English speakers were active in parts of the left-hand side of the brain that are related to the meaning of words when doing math. In the same study, Chinese speakers seemed to use additional brain regions concerned with the visual appearance and physical manipulation of numbers. It’s possible that the way the Chinese language expresses language (such as representing twenty-one as ‘two ten one’) makes Chinese speakers less reliant on language-processing parts of the brain. The way that Chinese numbers are named seems to support easier learning compared to a language such as English. The Chinese language is structured in a way that supports efficient calculations. Once you learn Chinese for 1 to 10, then you can count up to 99 before you need to learn a new word. In Britain, ‘thirty’ is a new word for a young child to learn. In China, they just need to know ‘three-thirty’. ‘Eleven’ is ‘ten-one’ in Chinese (and in Japanese and Korean too). The language supports mathematical understanding. That’s perhaps why 4-year-old Chinese speakers can usually count higher than their English equivalents. The Chinese language also seems to support the understanding of the concept of fractions. ‘Fifty percent’ is an odd mishmash of English and French language root. In Chinese, it translates much more literally as ’50 out of 100’. Where we say ’three-fifths’, a rather odd and Victorian-sounding phrasing for 3/5, Chinese speakers say ‘out of five parts, take three.’ It’s much more literal and supports a visual understanding of fractions. These differences may seem small but when it comes to cognitive load and class time, they can make a big difference. Children in English speaking classrooms will need to learn how to spell tricky words like ‘forty’ (which isn’t spelled ‘fourty’ as might be expected). It adds to the mental load and fear of failure. Chinese only has nine number names, while English has more than two dozen unique number words with their own quirky spellings. By the time American children have learned how to spell ‘eleven’, Chinese children are already racing ahead. Japanese, Korean and Turkish also express numerical words much more simply than English. When Turkish-speaking children were taught a numbered board game they advanced in their counting skills more quickly than English-speaking Canadians, despite the fact the Turkish children had previously had less math tuition. In a related study, Turkish schoolchildren learning to count in their native language advanced more quickly than Canadian schoolchildren learning in English. China, Taiwan, Hong Kong, South Korea, and Japan regularly star in the top ten for international math performance, with the UK and the US coming in at positions 27 and 39 respectively. The linguistic transparency of the Asian counting system has been used to explain Asian students’ relative superiority in cross-cultural comparisons of mathematics achievement. Short of reconfiguring the way we name our numbers, what’s the solution? It seems effort also plays a part in outcomes. Consider the fact Chinese schools don’t have long holidays like UK schools, which means Chinese children could simply be spending more weeks a year studying math. Parental expectations and input into math learning in early years may also be helpful to development. Some elements of Chinese math success could be implemented at class level. There’s an argument for using abaci in the classroom, and for using Chinese teaching techniques such as “math mastery”, where the whole class focuses on one aspect of a math problem and doesn’t progress until everyone understands it. Lessons are shorter than the UK standard and employ a collective mindset. It seems that there may be more to Chinese math success than just its language foundation.